A short walk from the Krishna temple leads us to one of the most impressive figures in all of Hampi – the monolithic sculpture of Narasimha – the fourth incarnation of Lord Vishnu. To read the story of Narasimha, click here. 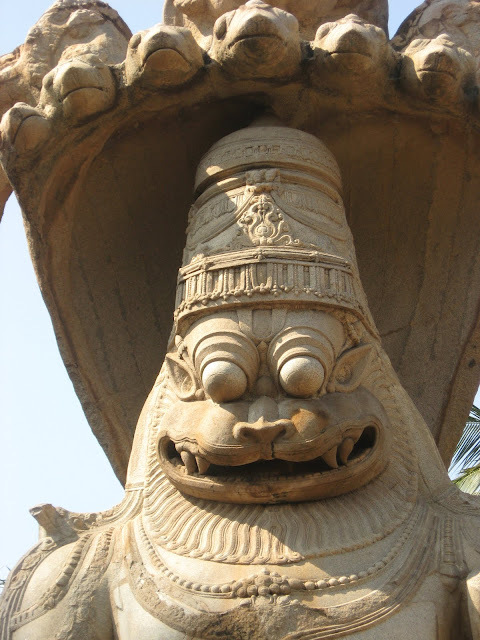 This figure is usually mistakenly referred to as ‘Ugra Narasimha’, which is the angry form in which he killed Hiranyakashipu. 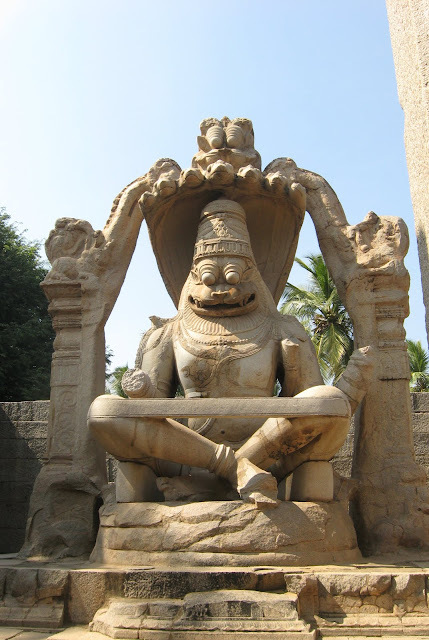 However, here, he is ‘Lakshmi Narasimha’, seated with Lakshmi on his lap, calm and smiling. Unfortunately, no trace of Lakshmi is seen, except a bit of her hand around his waist, and this is visible only on a close scrutiny. 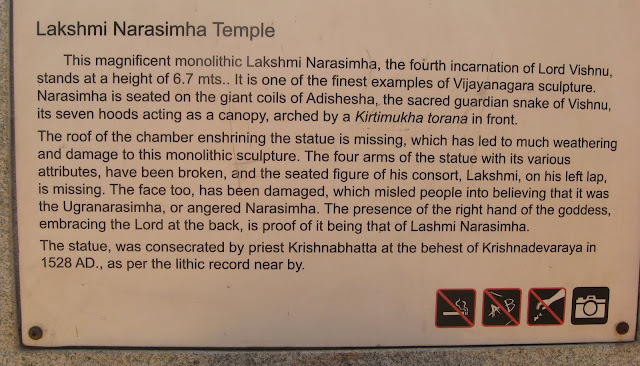 However, the form really doesn’t matter, for the figure is really an impressive one, and the fact that this is a 6 and a half meter high monolith, made at the time of Krishnadevaraya ( ~1528) is awe inspiring. Here is a closer look at his face and the seven-hooded snake over his head….. The canopy over the figure is no more, and the remnants of the structure around the idol show that it was a simple one, without all the beautiful carvings that are a major feature of all the other temples in the vicinity – which leads me to wonder if this was just the sanctum, and part of a much larger structure, or was it simply an idol commissioned for a purpose and placed in a small shrine to protect it from the elements….. 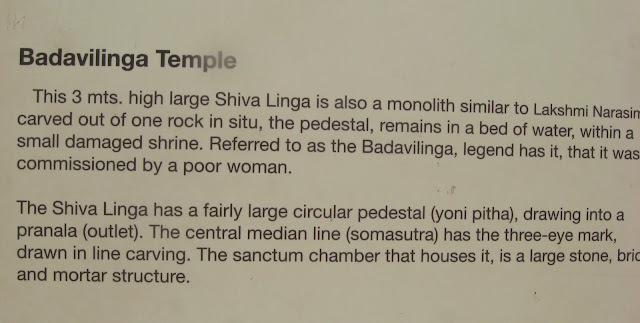 Nearby is a lingam – almost adjacent to this figure – which is believed to have been commissioned by a poor woman. Another monolith, it is as majestic as the earlier one, except for the embellishments. This is called the ‘Badavalinga’. I just couldn’t help wondering – If this was the contribution of a ‘poor’ woman, what would the economy at the time of the Vijayanagar Empire have been like! It must certainly have been a wonderful period to live in, if you disregard the wars of course! 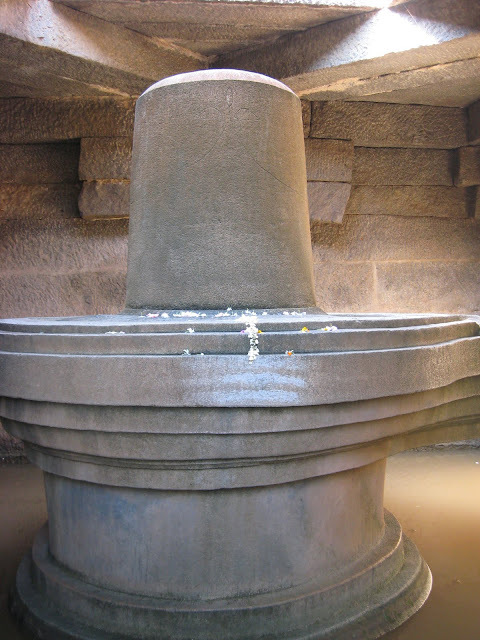 The board at the site told us that there was a pool of water around the lingam throughout the year, offering no explanations for the same. Our guide was of the opinion that this was simply the excess water leaking out from the ancient water systems here… which is quite probable. I wonder if there was a separate area for such idols commissioned by people….. which couldn’t be placed in a regular temple, but which had to be taken care of nevertheless, and prayed to, too! No matter what the answers, there is one thing for sure…. Hampi throws up a lot of questions and thoughts!